Combell opens a third data center in Zaventem, on top of the other locations in Diegem and Vilvoorde. Unique for Belgium is that, in this new center, a new multi-data center approach was used. Doing this makes downtime almost inexistent for business critical websites and applications. On top of the still ongoing plans for the construction of a company-owned data center in Ghent, Combell, the largest independent hosting company in Belgium, has invested in a new, heavily secured data center in Zaventem that has been arranged on top of the existing facilities located in Diegem and Vilvoorde. The new high quality data center is particularly energy efficient and thus more ecological. This goal has been attained by completely separating hot and cold air and by using energy saving equipment. The concept is, in itself, rather simple. Combell runs a double connection between both centers. This loop has been made in duplicate and the route has been chosen as to allow for an alternative route in case one of them gets damaged, e.g. because of road works. In each data center, servers that are identical copies of each other have been placed. If the server in one data center is not available, the other one in the other data center is. Other multi-data center solutions use a DNS system, but in that case, modifications are only processed very slowly (taking up to a couple of hours). 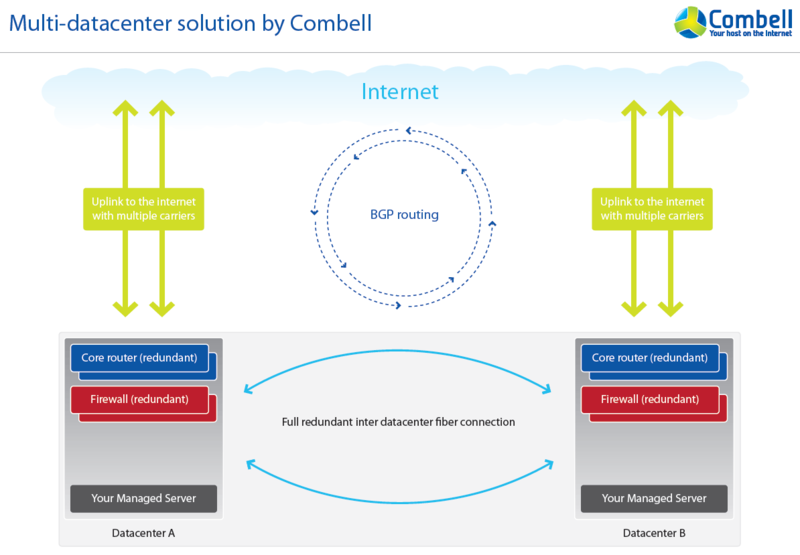 Combell has chosen a Border Gateway Protocol (BGP) thanks to which modifications are immediately active. This technique is mostly suited to large companies or websites with business critical applications – in other words, for websites where uptime is important in order not to lose business, e.g. for websites of multinationals or for important e-commerce websites.